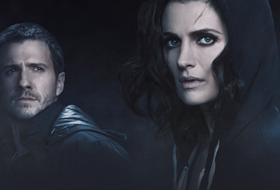 “Castle” is back (Season 5 premieres Mon., Sept. 24, 10 p.m. ET on ABC), and fans will finally get to see what happened after that fateful smooch between Castle (Nathan Fillion) and Beckett (Stana Katic) that was four seasons in the making. I won’t give anything away, I’ll just say this: You won’t be disappointed. 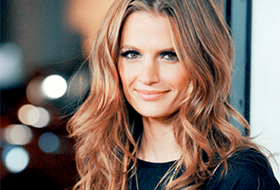 And star Stana Katic agrees. Last season’s finale made fans, myself included, so happy. Having played one half of these duo for so many years now, how did you feel about the hookup finally happening? Oh I’m very happy, of course. I think that we couldn’t stretch it any further — it happened at the right time. We have been on this journey with these two characters for four years, and they have been through every sort of danger and life-harrowing experience, and I think that it needed to happen. They had a rough year last year, of course … they were both keeping secrets from each other, thinking that it was in the best interest of the other person. It was great to see the evolution of the characters culminate in the two of them finally admitting their feelings for one another. Because as much as we’ve seen their feelings for each other, as viewers, watching them keep those secrets to protect the other person really proved that this is real love. We know they love each other, but it feels more like love now. Yeah, you’re right. Andrew [Marlowe, the creator] did a great job of earning it, earning this relationship now. I think after everything that the writers built, we can justify exploring it for a while, which is exciting for me as an actor — it’s a different phase in the show. And a different phase in Beckett’s life. This season picks up right where we left off … well maybe a few hours and rolls in the sheets later. What can you tease about this new facet of their relationship in the premiere? We see the sensual side of both of them, and we also see them being vulnerable with one another. It’s very cheeky — this entire season is tongue-in-cheek and naughty and fun. It’s been really neat to explore and play with that, and to see these two people get to know each other better. I love hearing that it’ll be fun. It’s that banter, that back-and-forth in their relationship that makes us love them together, whether they’re together or not. The fans really just want uninterrupted kissing. How much uninterrupted lip-locking has there been? [Laughs.] Oh my … people will be well pleased with the amount of physical interaction the Castle and Beckett characters have. It’s such a tight-knit group at the precinct. How long do you think they can keep it a secret? It’s really tough to keep a bomb like that quiet in a room full of detectives. It’ll come out towards the beginning quarter of this season, and it’s not exactly by choice. The episode that it comes out in, we’ll have a bit of fun with it, which is kind of exciting. Then there’s the business of Beckett having quit, but we know she can’t ever stay away from the job for too long, especially when it comes to her mother’s case. That was a driving force in her becoming a detective, and I think that the character has evolved from what she was in the first season. In the first season, when we did get to see inside of her, we realized that this was a really raw space and that, instead of having a clear view on that, she was emotionally reactive. The point that we’re at now in the beginning of Season 5, we have a new Beckett. She is very much in control and very clear thinking. When she is confronted with the next layer of the mystery behind her mother’s murder, and when she’s given a monumental piece of information in solving the case and bringing that murder to justice, she is so clear and so focused that it makes her lethal. That’s a new type of Beckett. She was originally just quote emotional when it came to that storyline, and Montgomery was always that voice that said, “Focus on the evidence. Stay clear. Think clearly. Don’t get emotional.” And it wasn’t something that she could do easily. Now she’s there and that makes her dangerous, for the bad guys. I love tough Kate. Andrew also said that after such a heavy season last season, we’ll get more levity this season. What other fun cases have you guys tackled so far shooting this season? We will be starting the Star Trek episode soon and the director is Jonathan Frakes who played #1 on “The Next Generation.” And we also have an episode that’s kind of documentary style story. The gang comes upon a story where a documentary team was filming the murder victim, and they decide to follow the team as they are trying to resolve the case. Of course there’s the added element of Castle and Beckett trying to keep their relationship secret while this documentary crew is following them around. We filmed it very much in the vein of “The Office,” so there was really interesting. There’s a lot of breaking of the fourth wall … it was funny getting used to playing with the camera and having the character be almost another character in the story. There are a number of episodes that I think will open up the storytelling and add some fun for viewers.